We all know that 2014 has been declared as the hottest year globally by the Meteorological department of United States of America. Climate change is a global challenge which is likely to affect the mankind in substantial ways. Not only climate change is expected to affect physical health, it is also likely to affect mental health. Increasing ambient temperatures is likely to increase rates of aggression and violent suicides, while prolonged droughts due to climate change can lead to more number of farmer suicides. Droughts otherwise can lead to impaired mental health and stress. Increased frequency of disasters with climate change can lead to posttraumatic stress disorder, adjustment disorder, and depression. Changes in climate and global warming may require population to migrate, which can lead to acculturation stress. It can also lead to increased rates of physical illnesses, which secondarily would be associated with psychological distress. The possible effects of mitigation measures on mental health are also discussed. The paper concludes with a discussion of what can and should be done to tackle the expected mental health issues consequent to climate change. Vehicular pollution is one of the major contributors to the air pollution in urban areas and perhaps and accounts for the major share of anthropogenic green-house gases such as carbon dioxide, carbon monoxide, nitrogen oxides. Knowledge of human health risks related to environmental exposure to vehicular pollution is a current concern. Analyze the range health effects are attributed varied constituents of vehicular air pollution examine evidence for a causal association to specific health effect. In many instances scenario involves exposure to very low doses of putative agents for extended periods, sometimes the period could mean over a lifetime of an individual and yet may result in small increase in health risk that may be imperceptible. Secondary data analysis and literature review. In environmental exposures, traditional epidemiological approaches evaluating mortality and morbidity indicators display many limiting factors such as nonspecificity of biological effects latency time between exposure and magnitude of the effect. Long latency period between exposure and resultant disease, principally for carcinogenic effects and limitation of epidemiological studies for detecting small risk increments. The present paper discusses the methodological challenges in studying vehicular epidemiology and highlights issues that affect the validity of epidemiological studies in vehicular pollution. Background: Noise-induced hearing loss (NIHL) is one of the most prevalent occupational illnesses, with a higher incidence in the heavy industry. Objectives of the Study: The aim of this study is to investigate the prevalence of NIHL in Greece and explore its correlations with other job and individual-related factors. Materials and Methods: Questionnaires were administered, and audiograms were conducted to 757 employees of a shipyard company in Greece, both white- and blue-collar, during the period 2006-2009. A modification of the 1979' equation of the American Academy of Otolaryngology was used to calculate hearing loss. Statistical analysis was conducted by means of the SPSS v. 17. Results: A 27.1% of the employees were hearing handicap. Hearing loss was correlated with age, past medical history of ear disease (Meniere's disease, acoustic neuroma, otosclerosis) or injury, hyperlipidemia, job title and level of education. A few questions on subjective hearing ability and symptoms showed strong discriminatory power of hearing pathology. Conclusions: The results of this study emphasize the burden of disease in the shipyard industry, and the need for continuous monitoring, implementation of preventive measures and hearing conservation programs. Background: Noncommunicable disease (NCDs), psychological, substance use disorders, and stress-related issues have been less understood in Indian industrial settings. Systems for screening and early identification of the above have not been integrated in workplaces, nor there is a strong regulatory backing for the same. Aim: To explore the feasibility of integrating mental health and select NCD risk factor screening with the periodical medical examination of employees. To identify proportion of employees with select NCD risk factors and symptoms suggestive of mental health problems. Settings and Design: Around 10% of employees from a leading motor industry in Bangalore, (706) participated in this cross-sectional voluntary screening program. Materials and Methods: This screening was conducted as a part of their annual medical examination. A mixed method of self-report and interview administered technique was adopted for the same. Statistical Analysis: Descriptive statistical methods (proportions, median, mean, and standard deviation (SD)) and Chi-square test of significance. Results and Conclusions: Screening revealed the following; tobacco use (18%), alcohol use (57%), perceived work stress (10%), and obesity (3%). Nearly 23% screened positive for psychological distress. Time consumed for this assessment was 1-5 min. Initial attempts point out that it is feasible to integrate screening for mental health, substance use, and NCD risk factors in periodic medical examination using a combination of self-report and interview-administered method, though further detailed assessments for confirmation is necessary. Background: The workplace is increasingly being used as a setting for health promotion and preventive health activities; not only to prevent occupational injury, but to assess and improve people's overall health. Objective: This study aims at developing and implementing a healthy workplace model in a software industry of Puducherry. Methods: Operations research was carried out in a purposively selected industry in Puducherry. The study was planned in four phases-baseline assessment and risk profiling, intervention, final evaluation and dissemination of results. Baseline evaluation of employees (n = 907) was done by a self-administered questionnaire to collect sociodemographic variables and risk factor profile using noncommunicable diseases (NCDs) LITE Proforma. Results: Healthy workplace committee comprising of several stakeholders was formed, and a formal launch of the health awareness campaign was organized. Broad themes for health education sessions and support activities were identified. Risk profiling of employees showed high levels of risk factors and morbidity-more than 15% were found to be hypertensive and around 55% were obese. Stress and back ache were reported by almost half of the respondents. Modifications in the workplace targeting physical and psychosocial work environment were suggested to the committee, as part of the initiative. This study has demonstrated the feasibility of developing and implementing a healthy workplace model in South India. This model can be replicated or adapted in other industries for health promotion and prevention of NCDs. 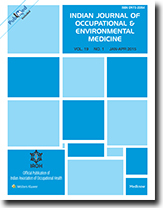 Conclusion: Dedicated and concerted efforts of the management consistent with the requirements of safety, health and environment at work place with appropriate support from the health system can improve the quality of work and working life. Background: American Optometric Association defines Computer Vision Syndrome (CVS) as "complex of eye and vision problems related to near work which are experienced during or related to computer use." This happens when visual demand of the tasks exceeds the visual ability of the users. Even though problems were initially attributed to computer-related activities subsequently similar problems are also reported while carrying any near point task. Jewellery manufacturing activities involves precision designs, setting the tiny metals and stones which requires high visual attention and mental concentration and are often near point task. It is therefore expected that the workers engaged in jewellery manufacturing may also experience symptoms like CVS. Aim: Keeping the above in mind, this study was taken up (1) To identify the prevalence of symptoms like CVS among the workers of the jewellery manufacturing and compare the same with the workers working at computer workstation and (2) To ascertain whether such symptoms have any permanent vision-related problems. Setting and Design: Case control study. 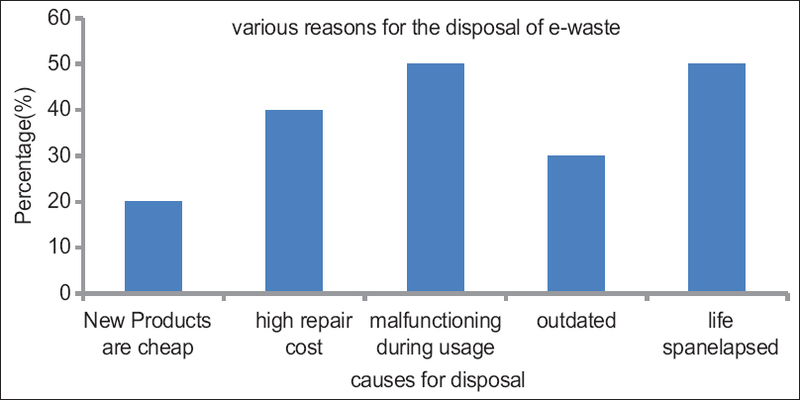 Materials and Methods: The study was carried out in Zaveri Bazaar region and at an IT-enabled organization in Mumbai. The study involved the identification of symptoms of CVS using a questionnaire of Eye Strain Journal, opthalmological check-ups and measurement of Spontaneous Eye Blink rate. The data obtained from the jewellery manufacturing was compared with the data of the subjects engaged in computer work and with the data available in the literature. Statistical Analysis: A comparative inferential statistics was used. Results and Conclusion: Results showed that visual demands of the task carried out in jewellery manufacturing were much higher than that of carried out in computer-related work. Background: Changing profile of work force can give rise different types of injuries. Purpose: To analyse causative factors (Host-Agent-Event) in ocular trauma over last 15 years. Methods: Hospital based prospective study during 1997-2012.Detailed information on nature of trauma; agent and setting were recorded. Results: Cohort included 12365 eye injuries, 1241 serious cases. Prevalence - 0.45 /10000 Mean age 45.8 with bi- modal pattern of incidence, 3:1 male-female ratio. 80% closed globe, 48% workplace injury (90% in marginal labourers with an exponential annual increase). 10% cases from garage mechanics.60% of eye injuries in female were related to "social violence". Multivariate analysis has detected new causative agents. 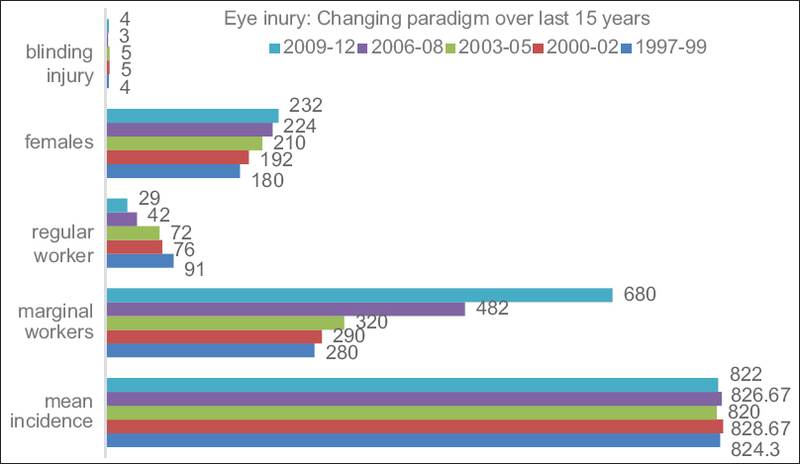 Conclusion: Significant change in parameters of trauma (Host-Agent-Event) is resulting in paradigm shift in eye injury. Unorganised unaccustomed labour in workplace injury and "social trauma" in females has become an important cause of eye injury. Background: The workers engaged in jewellery manufacturing exposed to various occupational risk factors that lead to development of musculoskeletal disorders. 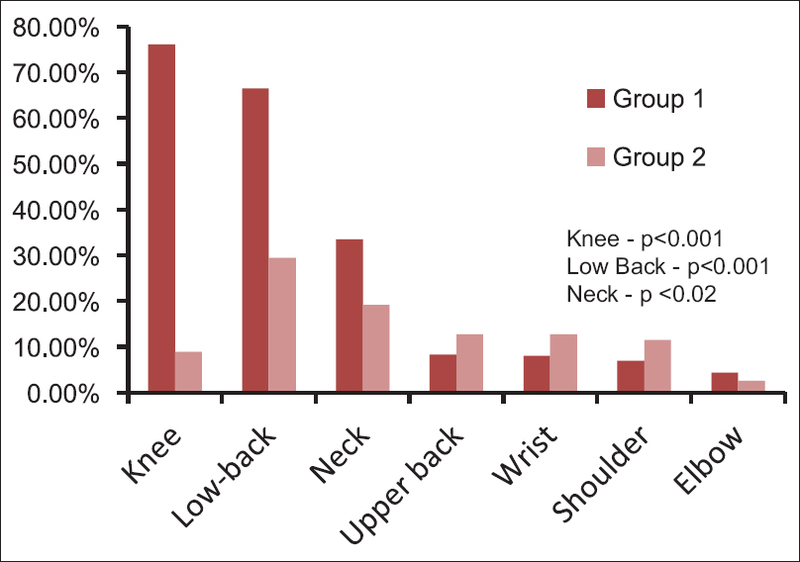 But there is scarcity of reporting the prevalence of the musculoskeletal disorders among them. Aims: To evaluate the prevalence of musculoskeletal discomfort among the workers engaged in jewellery manufacturing in India. Setting and Design: Case Control Study. Methods and Material: This study was divided into two phases. First phase: prevalence rate were calculated using Modified Nordic musculoskeletal questionnaire and compared with the control group. Second phase: strength, flexibility and tightness of the muscle groups (neck, lower back and knee) were evaluated through physical examination for the subjects who reported positive prevalence. Statistical Analysis: A comparative inferential statistics was used. Results: This study was divided into two phases. First phase: prevalence rate were calculated using Modified Nordic musculoskeletal questionnaire and compared with the control group. Second phase:strength, flexibility and tightness of the muscle groups (neck, lower back and knee) were evaluated through physical examination for the subjects who reported positive prevalence. Conclusions: The musculoskeletal disorders among the workers engaged in jewellery manufacturing were found to be specific to the occupation.